An outrageously delicious and exotic organic, Fairtrade chocolate; chocolate and orange in perfect harmony. Noir Orange is a bitter-sweet romantic interlude between the vigorous and authentic aroma of Peruvian cocoa and the sweet, fruity innocence of natural, organic orange. It contains no emulsifier and is conched for a very long time to give the best possible taste. 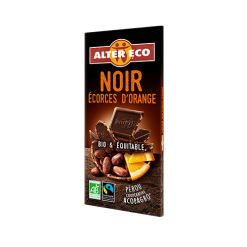 Based in Paris, France, Alter EcoEEs range of fairtrade products includes delicious, organic chocolate. Alter EcoEEs highly acclaimed fairtrade, organic chocolate was voted first amongst 24 leading brands by Que Choisir in France in 2009. It is prepared from aromatic organic Peruvian cocoa beans, combined with only natural, organic ingredients, and contains no emulsifier. Traditional production methods, based on very long conching times, ensure a sublime, well-rounded chocolate taste. The company was founded in 1998 by Tristan Lecomte, a leading figure in the world of fairtrade. Now, Alter Eco supports 40 cooperatives in 25 countries. It is a leading fairtrade brand in France, “sing partnerships with local farmers, and distributing organic and fairtrade products in several European countries, North America, Australia and Japan. With the motto, EENourishing Foodie, Farmer and Field,EE Alter Eco analyses environmental impact. It is involved in projects to preserve tropical forests and to promote awareness of sustainable development among the general public. The company is working to be a link between farmers and consumers, through quality gourmet products that are respectful of both humankind and the environment. Alter Eco aims to be socially just and environmentally reliable in offering delicious and healthy products to customers.